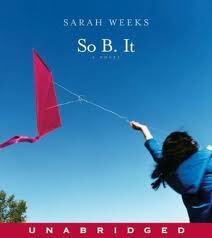 A sweet book about adapting to change. Ginger is a ginger-colored kitty who is pampered by the little girl he lives with. She makes him delicious meals and gives him a nice basket. He’s very happy, until…a little kitten joins the household. The kitten upsets Ginger by eating out of his food bowl and trying to call into his basket. Ginger is so upset that he decides to leave home. The kitten misses him and gets into all kinds of trouble. The little girl finally realizes that Ginger may be upset and might have run away. She finds him outsie in the rain, sitting alone under a bush. After bringing Ginger in, the little girl makes sure that Ginger has his own bowl and his basket back. The kitten gets his own cardboard box to sleep in. What a sweet ending when the little girl finds Ginger and the kitten in the cardboard box together. 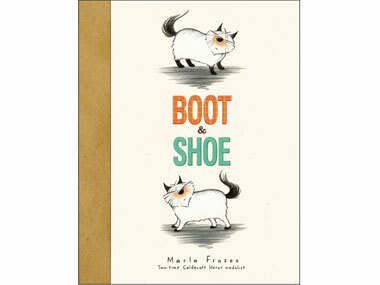 The book’s large type and simple theme makes this book great for young students and anyone who loves cats. This book is fantastic and has the funniest, sweetest ending. The language is up-to-date, the illustrations are really great. I loved it as did my students. Boot and Shoe are two adorable dogs who were born in the same litter. They do everything together, eat, sleep, pee…but Boot likes to be on the back porch and Shoe spends his days on the front porch. One day, a squirrel causes havoc. Boot and Shoe chase and chase the squirrel until they get totally turned around. Boot ends up on the front porch and Shoe ends up on the back porch. Boot and Shoe are determined to wait until the other returns to their proper spot. They wait and wait and wait. Finally, they decide they should check the other porch. Without seeing each other, Boot ends up back on the front porch and Shoe ends up back on the front porch. They wait all night for each other. Finally, they miss each other so much that they cry. All my students are really sad at this point in the story. Luckily, every dog has to pee. Where do Boot and Shoe finally find each other? You’ve got it…at their favorite place to pee, the bush. You can’t help but giggle. This very cute book is highly recommended for K-3 students. This beautiful book is a Caldecott Medal winner is based on a Yiddish folksong, “Hob Ich Mir a Mantl”. I read it to my preschoolers and kindergartners and got a wonderful response. This book is not only set apart because of its beautiful, colorful illustrations but because of the cutouts that show how Joseph creatively uses his old overcoat as it shrinks to a button and then, finally, to nothing. 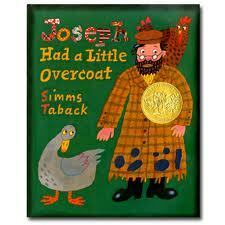 “Joseph had a a little overcoat. It was old and worn. So he made a jacket out of it.” My favorite message is on the last page. When Joseph finally loses the small button he’s made out of the remains of his overcoat, he says, “So Joseph made a book about it. Which shows…that you can always make something out of nothing.” A great message and a beautiful book for little ones. 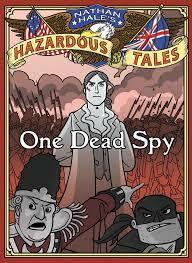 Another great graphic novel series. This series focuses on the greek gods. The pages are full cover and the author, George O’Connor pulls from historical texts as he retells the myths of each of the gods he writes about. The illustrations are full-color and dramatic and are a real draw for students. 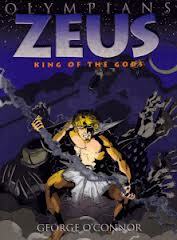 The series includes books on Zeus, Athena, Hades, Hera and Poseiden to be published this month. Highly recommended for tweens and middle school readers. If you haven’t read my review of One for the Murphys, please do. This book might be tied with One for the Murphys for my favorite book of the year. I closed it and thought “That was a great book.” I have a wonderful fifth grade reader who looked at me and said exactly the same thing. Heidi was a baby when her neighbor Bernadette found her outside in the hallway with her mother. Her mother is mentally disabled. Heidi’s mom knows only 23 words, most of the common, but there is one that only Heidi’s mom says, “Soof”. Bernadette is agoraphobic. Luckily, Bernie’s apartment has a connecting door with Heidi’s apartment. Together, they survive. Bernie manages everything, including teaching Heidi, while Heidi and her mom go out to do the shopping. Heidi wonders about her past, but her mother cannot give her any clues about it nor can Bernie. One day, Heidi finds an old camera with undeveloped film. She takes it in to be developed and finds a picture of her mother at a home for the mentally disabled in New York State. Heidi is determined to find out about her mother’s past. Her search, and the answers she finds, including the meaning of “Soof” make this book incredible. Highly recommended for middle readers. The 2012 Caldecott Medal winner. This is a terrific wordless story. 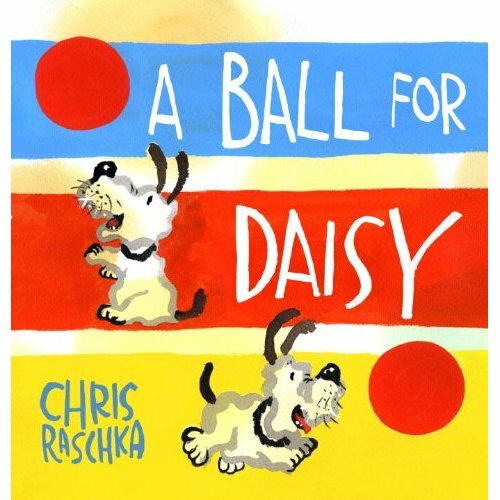 Students can follow along as I turn the pages and they “read” about Daisy the dog and her love for her red ball. One day, Daisy goes for a walk in the park with her owner. Daisy and a brown dog play with her red ball. When the other dog pops Daisy’s ball by accident, and the ball is thrown away, Daisy goes home and puts her head on her paws. No words are necessary to know exactly how Daisy is feeling. Everyone’s hearts go out to her. When Daisy goes to the park the next day, there is the brown dog with a blue ball. They play together. The book closes with Daisy happily sleeping on the couch with her new blue ball. This book was so fun to show my K and Prek students. The library was absolutely silent as my K students realized they had to follow each of the pictures in order to understand the story. We then went through the book together as students retold the story. My Prek students tended to shout out what they thought was happening. Either way was fine and very entertaining to watch my students faces as I turned the pages. The water color illustrations really shine.